Clean Well Water Report: How To Remove Iron Bacteria From My Well Water? Our problem is iron bacteria. We live outside of town and use well water. 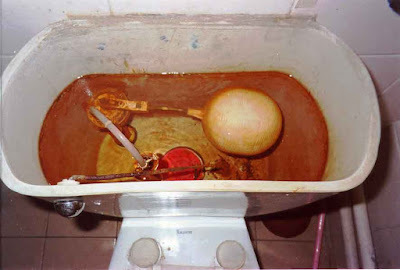 We get reddish rusty water and per your suggestion, I looked in the toilet flush tanks, and they are covered with slime and what looks like orange hair growing out from the sides of the toilet flush tank. We also get some bad sulfur odors, mostly if we leave the house for a few days to visit my parents or go out of town. We have a filter on the main pipe after our pressure tank, and that gets covered with orange slimy sediment too. I am pretty sure we have iron bacteria, but how do I get rid of it? I am on a low budget, sorry to say! Thanks for emailing. This is a common problem. Iron and sulfur bacteria use iron to form their cell walls and in the process create slime and often odors. Iron bacteria naturally occur in soil, shallow groundwater, and surface waters. These nuisance bacteria combine iron (or manganese) and oxygen to form deposits of "rust," bacterial cells, and a slimy material that sticks to the walls of pipes, pumps, and plumbing fixtures. One way to help cut down on the amount of iron bacteria in your well is to periodically do a chlorine shock. 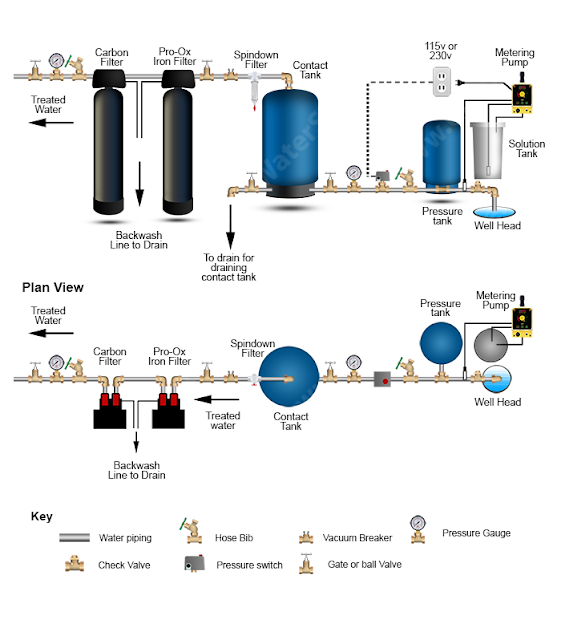 See more information on disinfecting the well with chlorine here. If you have a serious problem in your well with iron bacteria, you will need to contact a well professional to get help to try and eliminate the slime down in the well. To eliminate it in the pipes above ground, the lowest cost and best approach is to use an automatic chlorinator, followed by a filter to remove the rust and chlorine. Our chlorine injection system uses a metering pump wired to the load side of your pressure switch so that the pump comes on with your well. The pump will inject a mixture of chlorine and water into the plumbing via the injection check valve. Since we wire this to your pressure switch, we need to confirm the voltage of your well pump (usually it is 220v however). Once the chlorine is injected, we need “retention time” for the chlorine to react with the water and destroy the iron bacteria. This is done using a contact tank. 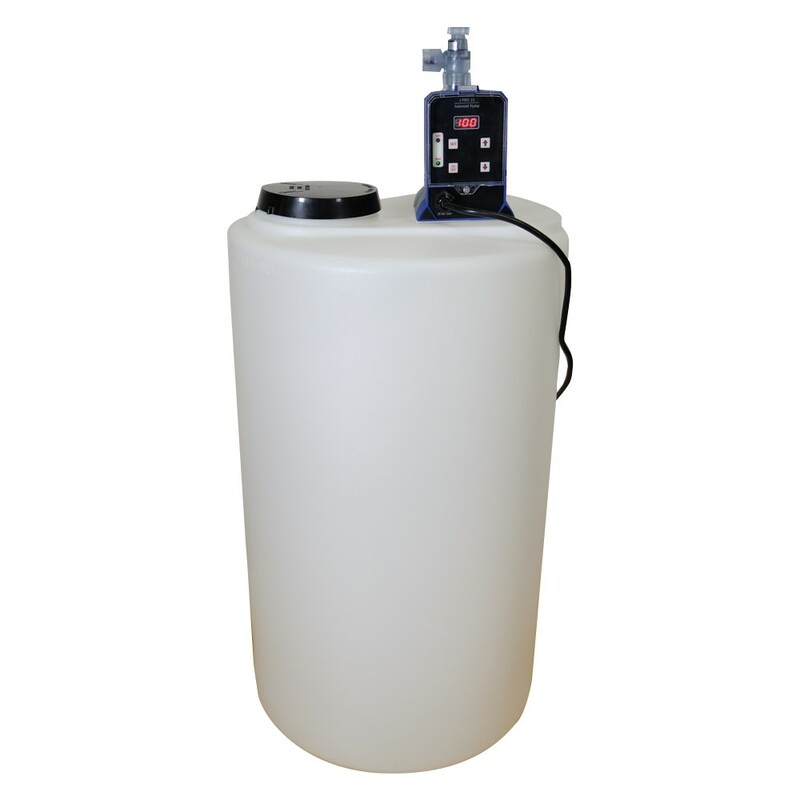 A 40 gallon contact tank will be able to provide ample retention time for the chlorine to react with the water. After the contact tank, the water will go into the iron filter. 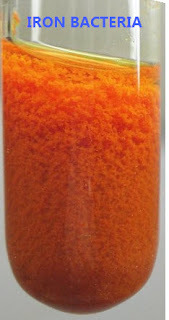 The iron filter will remove the iron and manganese from the water. It also loves the presence of chlorine and will take a lot of the leftover chlorine from the water. You shouldn’t have more than city water levels of chlorine in the house water after the iron filter but you can use a final carbon filter under the sink or for the whole house if you want water with no residual chlorine. A complete easy-to-install well water chlorination system for a Wide Range of Conditions and Well Water. Eliminate odors, bacteria and pretreat iron before filtration. Excellent Warranty: 1 years on the Metering Pump. All installation instructions as well as professional tech support is available as well. Questions? Call us toll-free 888-600-5426 or email us at office@cleanwaterstore.com!